Knossos was the capital city of Minoan culture that centered on the island of Crete. The Minoan civilization at Knossos represented a cultural high point in the Mediterranean Sea. According to Greek mythology, it was the capital of King Minos and the home of the labyrinth. Many details about the Minoan culture in Knossos remain lost to history. What is known about Knossos comes mainly from archaeological findings, specifically those of Sir Arthur Evans. During the Bronze Age, Minoan culture arose on the island of Crete. Many Minoan cities along the northern coast and the mountainous interior were constructed beginning around 2000 BCE. The Minoan cities were built with few defenses, which indicated that the Minoans controlled the sea and depended on their ability to keep raiders from reaching Crete. 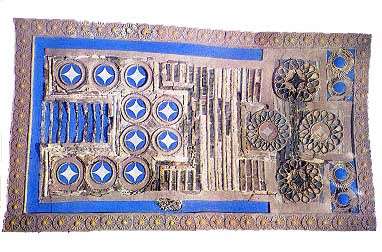 Commerce flourished at Knossos, and goldsmiths, sculptors, painters, and seal makers were patronized by the royal court and provided high-quality products. Minoan pottery and other artifacts have been found as far away as Egypt and Asia Minor. Knossos was largely destroyed around 1700 BCE, possibly because of an earthquake or tidal wave. The Minoans rebuilt the city only to see it destroyed again, possibly by the Mycenaean invasion ain the mid-15th century BCE. 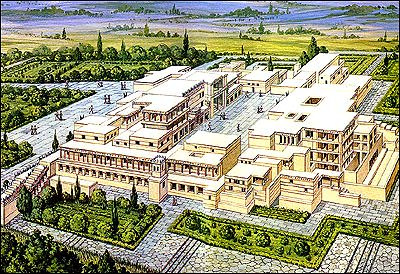 The central palace at Knossos was determined to be more than 226,000 square feet in area. Archaeologists found that the palace was the center of royal power but that it also had religious and administrative facilities. The complex included approximately 1,400 rooms, plus courtyards and corridors. The walls were faced with plaster or gypsum sheets and decorated with mosaics that emphasized animals, fish, and plants. The most famous examples include blue dolphins and scenes of young men and women leaping over the horns of charging bulls. The bull theme of the frescoes was repeated on many of the pillars, which had a horn-like taper toward the bottom. Other architectural features of the palace at Knossos included light wells to provide natural lighting in interior rooms and large stairways. Frequent doorways provided partitions and easy access to different rooms. At least some rooms served as bathrooms with functioning toilets and running water; the water was carried through sun-baked clay pipes. There was also a sanitation system that featured an elaborate scheme of drains, pipes, and conduits. Reflective pools installed into the floors provided extra elements. The Minoans of Knossos also developed an alphabet, now known as Linear A, from their earlier hieroglyphics. The Phoenicians used the Minoan alphabet, and the Mycenaeans later adopted it as their first written alphabet, which became known as Linear B. After the Mycenaean invasion in the mid-15th century BCE, Minoan civilization declined, and although the Mycenaeans withdrew from Crete after several centuries, a unique Minoan culture no longer existed. Knossos continued to exist, albeit as an ordinary Greek city until Roman occupation, which lasted through the fourth century CE.